One of the things I really miss about reduced mobility is the freedom to wander at will through the glorious Australian landscape. 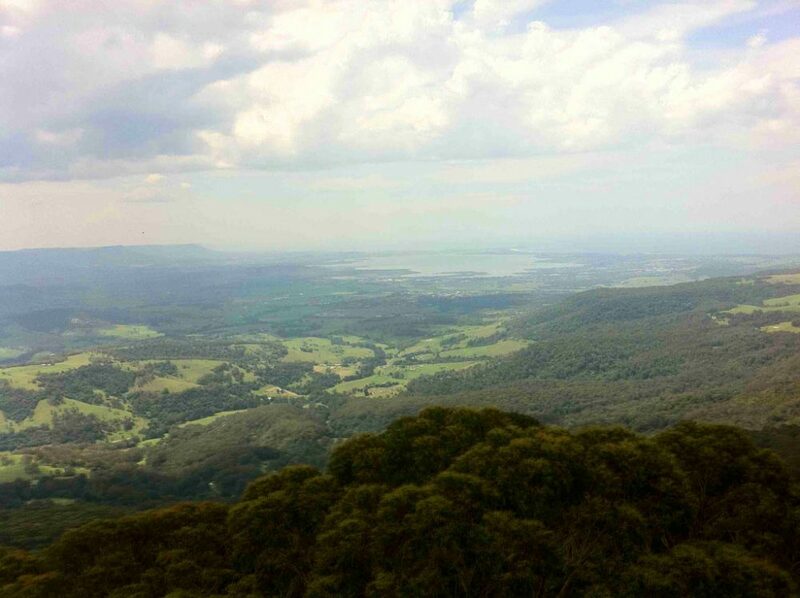 I particularly miss bushwalks through deserted fire trails near my previous home in the Blue Mountains, so imagine my joy at discovering the Illawarra Fly Treetop Adventure which allowed me to ‘walk’ through a beautiful rainforest in the Southern Highlands of New South Wales. Even more thrilling was the fact that this was no ordinary bushwalk; the trail itself is 500 metres long and has an average height of 25 metres above the ground! This affords visitors a rare glimpse into rainforest life as they walk, or wheel, through the treetops. The unusual point of view is provided by a steel canopy structure, one of only four in the world according to the promotional material, with the other three also in Australia (although a friend told me she experienced something very similar in a forest in Costa Rica). The experience begins as you leave the Visitor Centre and walk along a cleared path into the dense bush of the Illawarra Escarpment. It doesn’t take long to arrive at the beginning of the Treetop Walk, however, the initial path is very steep in places. I was on my trusty travel scooter, Little Red, but I would not have liked to negotiate the path without my carers on hand and certainly not in a manual wheelchair. I actually needed my husband to give the scooter a little push at the end of the walk as the gradient was so extreme. 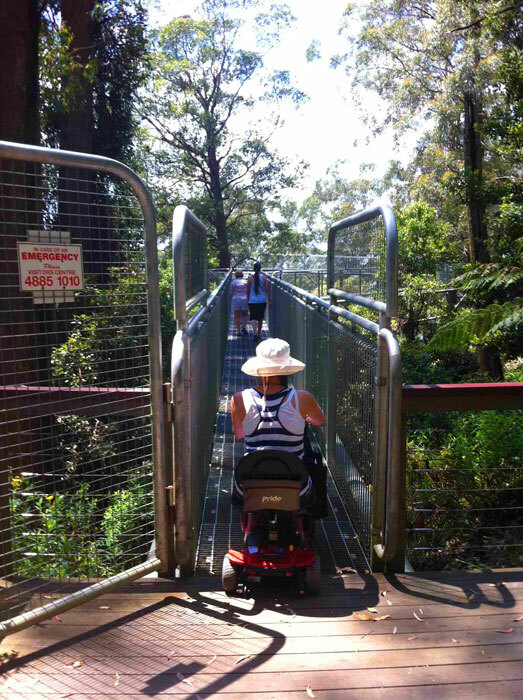 If you are taking a manual wheelchair, you can request that the Illawarra Fly staff use their courtesy cart to take you to the beginning of the Walk and then pick you up at the end. You will need to be able to transfer in and out of the cart and stow your chair at the back. If taking a motorised wheelchair, you should definitely have a seat belt. Once on the Walk, you can take your time to enjoy the peaceful, natural environment, completely surrounded by the trees. Whether by design or lucky accident, there is a constant space of about 10 centimetres between the top of the fence and the bottom of the handrail which makes a perfect viewing window for people at wheelchair height. One tiny niggle for me was that the information boards dotted along the way were too high for me to read from my seated position. The Walk has two swaying, springboard cantilevers which allow you to head out a little from the forest and enjoy the breathtaking views. Now is possibly a good time to mention that this attraction is probably not suitable for those afraid of heights! The majority of the floor consists of grates so that you can see all the way to the forest floor and there can be quite a lot of movement, particularly when others decide to put a little bounce in their step. 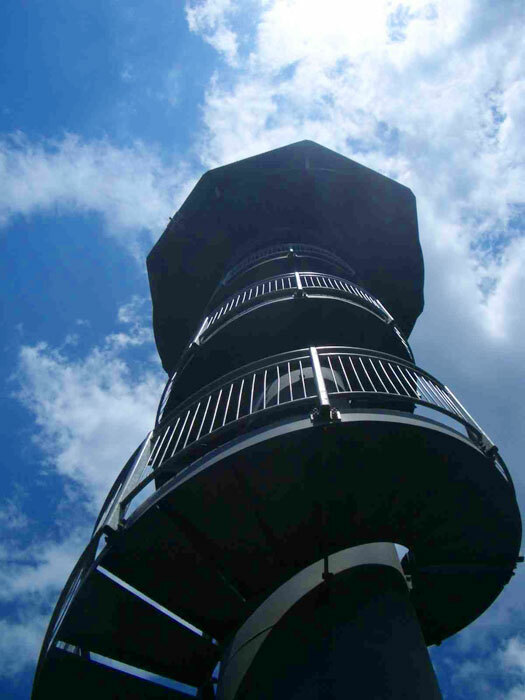 The highlight of the Walk for many is the 45 metre high ‘Knights Tower’, accessed by 106 spiral steps (my nine-year old son confirmed the step tally on his third trip up and down the tower and accurately concluded that was where the cafe in the Visitor Centre got its name). Obviously the spiral staircase was not accessible to me, but I was happy to enjoy the view from the platform below the tower and take some photos while I waited. There are even a few perspex panels so I could get right up close to the edge and peer down to the tree ferns below. I have always loved storms, so it was a bonus for me when huge clouds began rolling across the amazing landscape. We made it back to the Visitor Centre just as the first big raindrops began to fall, giving us the complete rainforest experience. Back at the cafe, we dried off and ate lunch until the rain passed. The cafe was actually quite pricey with my friends paying what seemed like a ridiculous price for pies, chips and a bit of salad. In hindsight, we probably should have planned to have lunch at nearby Robertson which, I’ve heard, boasts a famous pie shop and a great pub. The Illawarra Fly is open every day except Christmas Day regardless of the weather, although may close for short periods due to lightning. The prices on the web site did not indicate a concession for wheelchair users, however the lady at the ticket office accepted my Companion Card without question. Overall, I really enjoyed this experience and am hoping to go back again for a Sunrise Tour in the future (my son and I are early birds but my husband is a night owl: I think I have some convincing ahead of me).